So perhaps it's a bit ironic to be pondering Winterreise just after Valentine's Day (then again, perhaps it's not). 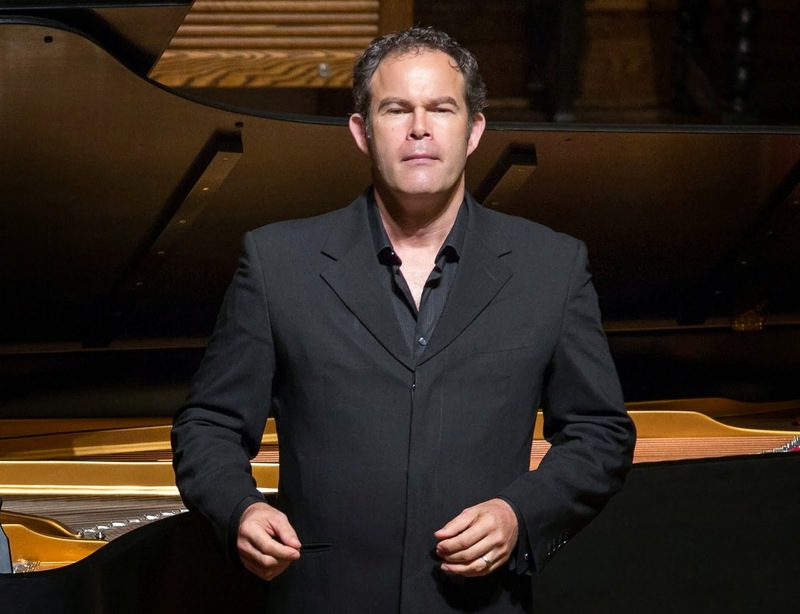 Although truth be told, bass-baritone Gerald Finley (above) and pianist Julian Drake brought the cycle to Jordan Hall as part of Celebrity Series more than a week ago (at nearly the close of a North American tour). I've been considering their performance ever since. Finley and Drake have been showered with accolades for their efforts (the latest landed from the Times on Friday), which is to be expected; both are major names, and major talents, and their performance was a model of thoughtful, high-cult execution. Which much of the time did Schubert full justice. But not all of the time. Finley is in possession of a superb instrument, and Winterreise sits comfortably in his considerable range (though originally composed for tenor, it was actually popularized by baritones). Finley's low notes toll like bells in the deep - and his range is fluid and strong all the way to a top of brightly polished bronze. But beneath its burnished surface, his voice conceals few unexpected colors - and this is something of a problem for Winterreise, as it's most gripping when a subtle variety is at work within the orbits of its desolate descent. Finley's acting ability also seemed slightly tested by the text. Schubert's hero is a naif experiencing romantic torment for the first time; but Finley reads as a brooding, slightly stolid master of early middle age; sensitive, yes, but not quite vulnerable. Thus his Winterreise often read, perhaps inevitably, as a suite of memories drawn from pondered rather than fresh experience. That said, his interpretations were often superbly realized, particularly when the text treated the hero's dawning self-awareness rather than the bleeding edge of his pain. Thus there were traces of ironic affection even amid the tears of the opening "Gute Nacht" ("Good Night"), and Finley's readings of "Täuschung" ("Deception") and "Der Wegweiser" ("The Signpost") proved complex and exquisitely keen. Likewise the reveries of "Rückblick" ("Retrospect"), "Frühlingstraum" ("Dream of Spring"), and "Der Lindenbaum" ("The Linden Tree") were quietly moving in their different modes of yearning. Still, one could argue that the baritone failed to conjure the sense of derangement that begins to haunt the hero's despair, as his thoughts turn again and again toward the prospect of Death in this freezing landscape. Thus "Das Wirtshaus" - in which the hero hallucinates that a graveyard is in fact an inn - and particularly the bizarre "Die Nebensonnen" ("Phantom Suns") lacked the eeriness they sometimes exude. 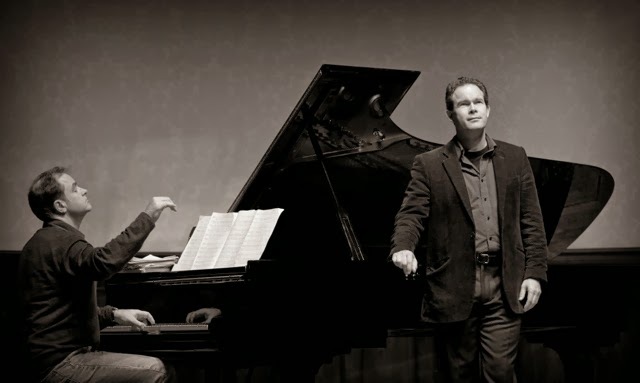 Julian Drake with Gerald Finley in days gone by. In a sudden about-face, however, Finley triumphed in the cycle's final vision, "Der Leiermann" ("The Hurdy-Gurdy Man") in which the hero passes beyond death into an icy state of permanent desolation - accompanied, perhaps, by Schubert himself. Finley sang these famous stanzas in little more than whisper, but the effect was galvanizing; the audience all but leapt to its feet - well before accompanist Julian Drake (above, with Finley in a previous performance) was quite ready to lift his fingers from the keys. I, for one, understood why - it's often said that Winterreise is a duet between voice and piano, but rarely has that been quite as evident as it was here. Indeed, sometimes Drake seemed the true shaper of the arc of the performance, even as he gave full due to the many colors and effects Schubert has woven throughout the piece. We all but felt the frosty drips of "Gefror'ne Tränen" ("Frozen Tears"); we saw the murder of crows slowly circling in "Rückblick;" and perhaps most memorably of all, we felt the frozen drone of the Hurdy-Gurdy Man sink deep into our bones - never to be forgotten. At such moments, Schubert's vision was, indeed, still terrible - and still terrifying.